I often marvel at God’s hand on ICR’s ministry. We have experienced times of plenty and seasons of leanness. Through it all, ICR has remained sensitive to the Lord’s leading by pursuing new opportunities when appropriate while continuing to distribute free publications like Acts & Facts and Days of Praise. God has been faithful to supply our needs through His people, and those who financially partner with us will one day share in the eternal rewards of our work together (1 Corinthians 3:7-8). God has been faithful to supply our needs through His people. The large gifts didn’t impress Jesus because the givers gave “out of their abundance” and still had plenty left over. But the widow’s two mites (worth about one fourth of a penny) so impressed Christ that He used it to illustrate the point that God measures a gift not by its size but by the motive with which it is given and the amount left un-given. In God’s eyes, the widow’s small gift was more valuable than all the other gifts combined because “she out of her poverty put in all the livelihood that she had.” This stands as one of the greatest examples of sacrificial giving in all of Scripture. I did a little math this a.m., and if each one of [your readers] gave $16 the $8 million would be available. Many people believe a little wouldn’t help—they want to do a lot…. [But] while God appreciates the $1,000 gifts, what He really wants is the continual, persistent, faith-devoted $0.25 a day. We often miss the joy of the $0.25 by wishing we had the $1,000 to give. I only mention it because…I wondered how much it would take to raise the $8 million if we all pitched in. Perhaps others have wondered too. — S. B.
I couldn’t have said it better. A sizeable majority of our readers have not yet partnered with us. 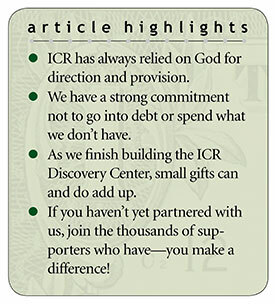 Don’t “miss the joy” of giving to a worthy Christ-honoring cause like the ICR Discovery Center because you don’t believe your gift is large enough. Your help does make a difference, and many of those “mites” add up and can be used by God to do great things for His work! Cite this article: Henry M. Morris IV. 2018. Don't Miss the Joy. Acts & Facts. 47 (5).